The students of Marjory Stoneman Douglas High School were well practised on how to respond in an active shooter situation - the school has lockdown drills, security systems and restricted entrances. But a sole gunman on Valentine's Day was still able to kill 17. 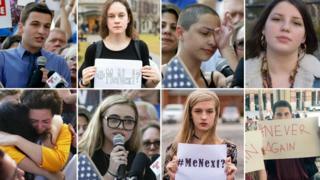 From the school's survivors, and other students across the US, movements have sprung up in its aftermath rejecting what has been dubbed the "new normal" for their generation. Thousands of teenagers, including many still too young to vote, have become grassroots activists. Social media has become a tool for their ideas and campaigns to spread. Their calls for gun control are not different to those in the aftermath of other tragedies - but the maturity and voracity of the students publicly voicing their demands has led many on social media to say this time feels different. As Wednesday's atrocity took place, he was forced to huddle in darkness with 60 other students for over an hour and a half as shots rang out throughout their school. 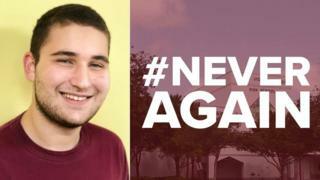 Alex and four of his friends founded the Never Again campaign in the immediate aftermath. Now over a dozen of them are tirelessly campaigning and making the rounds on US cable news networks to share their message that the school's survivors will not back down. "It is absolutely insane that a 19-year-old cannot purchase alcohol but can walk in and buy an AR-15 - a weapon of war, by all means a weapon of mass destruction," he said. "You don't need this to protect your home or your family, its absolutely absurd you can sell it commercially." They have announced the March for Our Lives to take place on 24 March, in conjunction with the Everytown for Gun Safety, calling for the prioritisation of children's lives in the gun control debate. 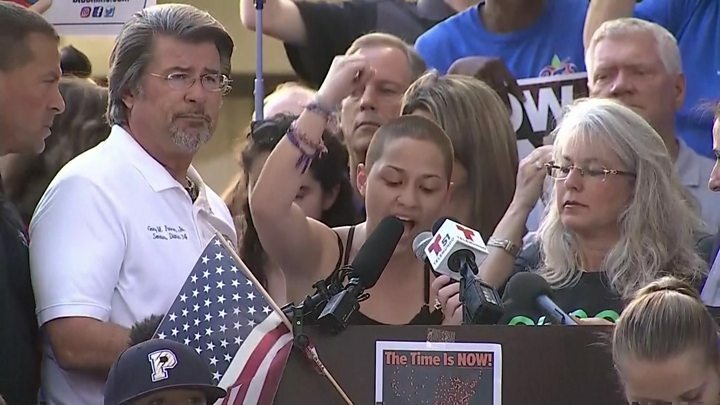 Media captionOn Saturday student Emma Gonzalez, an organiser of the march, told lawmakers: "Shame on you!" Student Cameron Kasky, also 17, said the group's aim is to "create a new normal where there's a badge of shame" on politicians accepting donations from gun lobbyists. "My message for the people in office is: You're either with us or against us. We are losing our lives while the adults are playing around," he told CNN. The group are encouraging other students around the country to join with them and protest - a movement that is already happening online. Lane Murdock, who is 15 and lives in Connecticut, was one of the students who saw events in Florida and felt mobilised to try and make a difference. "When I saw the news the most saddening thing was that it felt normal," she told the BBC. "I'm from Connecticut where Sandy Hook happened - I've been surrounded by this reality all of my life." 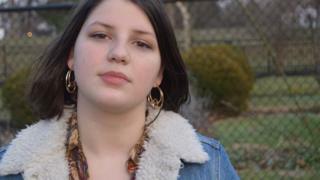 She, like other US students, has grown up learning lockdown drills since she was in elementary school. She remembers her first at seven years old. "We all hide in the safest corner, huddle together with our knees up against our chest while our teacher turns off the lights, closes the blinds and locks the door." She had the idea to launch an online petition for a national student walk out on the anniversary of the Columbine attack. After a "whirlwind" few days, Lane's campaign has garnered tens of thousands of followers and signatures. The teenager, who says she has ambitions of being a journalist, is now liaising with national advocacy groups to make sure any strike action is cohesive and effective. Her mother, Bari, says that she is "beyond proud" of her daughter. "If anything is going to change, it is up to our youth. We're failing our children - I hope it takes off," she said. Another student hundreds of miles away from Wednesday's attack, Violet Massie-Vereker, had her own simple and provocative idea to draw attention to the reform debate. 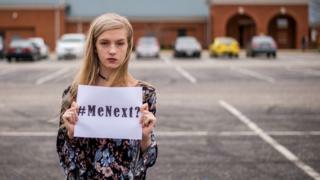 Following on from the success of the #MeToo campaign, she proposed a twist exposing the reality for student and parents' concerns with #MeNext? 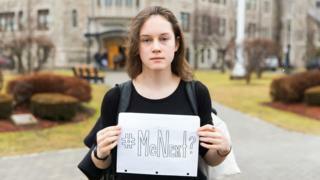 She stood with a sign outside her high school in Pelham in New York alongside several other students and local parents. "A number of people have told me it's frightening and powerful, and really sends a message," the 16-year-old told the BBC. At her high school, the shooting was followed by a special assembly, where the principal gave an address to students where they went over their lockdown procedures. "She told us, I wish I could assure you that nothing could happen here, but I can't," Violet said. Others have joined in their social media campaign, posting pictures themselves or of their children online with their own signs. Their Facebook page now has over 10,000 likes of its own. "It's a drop in the bucket within the debate, but I sincerely believe this is the beginning of the end. Students should harness their fears to help promote a change." In West Michigan, teenagers from Kalamazoo Central High School started their own petition titled "Students Fighting Guns Since Adults Won't". It has almost 50,000 signatures. Julia Kemple-Johnson, 17, said the idea came from a discussion between friends a day after the Parkland shooting. She said they felt like they were having a discussion about gun violence every other week. "I can't remember a time when I didn't know about mass shootings," she told the BBC. "Our teacher told us that Columbine was a wake-up call at the time, but we were born after that and we are just so used to it, so desensitised." They are trying to work with groups from Colorado and connect with survivors in Florida. Their aim is to contact their local state representatives asking for the introduction of mandatory waiting periods for background checks, and a review of semi-automatic weapons. In Maine, students from Mount Desert Island High School held their own silent protest to the attack. The networks are growing hourly, and the groups' teenage organisers are trying to intersect to create cohesive action. Tweets by survivors from Wednesday's Florida attack are now being met with hundreds of shares and messages of support from their national peers. Whether meaningful change is enacted from the emotional response remains to be seen, but thousands of students without the power to vote are doing their very best to make their voices heard.